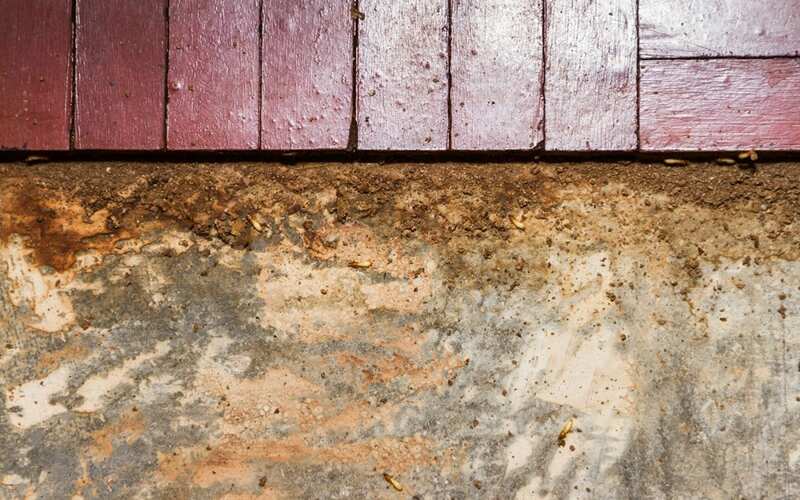 Termites can hide in the foundation and dark corners of your home for years without you ever noticing they are there. Unfortunately, in that time, they’ll be feeding on the wood in your home, slowly causing a lot of damage. That’s why it’s important to look for early signs of termites before they completely infest your home and cause significant damage. Here are seven signs of termites in your home. One of the first signs of termites is usually flying termites. Termites flying around are looking for mates to breed with and start a new colony. Some termites might fly around at night and others during the day. Most times, they will swarm around your house after a heavy rain, so be sure to keep an eye out during these times. You can also look for termite wings around your home, as they lose their wings after they mate. Another sign of a potential termite infestation is small clicking sounds within your walls. Despite being small in size, termites can make a lot of noise. Some termites will bang their heads against the wood to signal danger, and others are very loud when eating. If you put your ear to a wall in your home and hear strange noises coming from inside, you should probably investigate the source. Many people mistake termites for ants that are white, but ants and termites have a few notable differences. For instance, termites can almost look translucent in color. Termites also have an antenna that sticks up straight while ants have an antenna that is slightly bent. And lastly, white ants don’t actually exist in nature, so if you see a bug that looks like an ant but is white in color, assume that it is a termite. If you begin to notice that your doors and windows are becoming stiff and hard to open, termites may be the cause. While they are tunneling through the wood inside your home, they cause a lot of moisture. This can lead to warped doors and windows, which then become jammed. Termites that are burrowed into your drywall will eat the wood from the inside out. If you tap on one of the walls in your home and it appears to sound hollow, termites might be to blame. Many times, the damage isn’t discovered until the wall needs to be replaced. Another way to tell if you have termites is by their droppings, called frass. A termite inspector will always search for this when combing your home for these pests. Termites will push out their droppings through holes near their nests. The feces appear as small dark marks and a powdery, black substance near their nests. Every homeowner should be aware of the signs of termites. These pests can invade your home and cause a significant amount of damage. It’s important to keep an eye out for these signs so that you are able to eliminate termites before they wreak havoc on your home. If you suspect termites are already in your home, be sure to consult with a professional termite inspector as soon as possible. Rhode Island Real Estate Inspection Services offers termite inspections to the entire state of Rhode Island, along with many other inspection services for residential and commercial properties. Contact us to schedule your appointment.